A sort of topic-specific collection of links from about the last year, broadly talking about inclusion in communities, online and off, especially in geek(y) spaces. What kind of discourses and conversations do we want to encourage and have? Nalo Hopkinson’s WisCon 2016 Guest of Honor speech: “There are many people who do good in this field, who perform small and large actions of kindness and welcome every day. I’d like to encourage more of that.” In this speech Hopkinson announced the Lemonade Award. How do we reduce online harassment? What does it take to make your community more inclusive? This entry was posted in Uncategorized and tagged accessibility, anonymity, art, childcare, comics, community, community standards, conferences, cons, diversity, fandom, Gaming, harassment, intersectionality, Linkspam, names, online abuse, online harassment, Open source, pseudonymity, research, science fiction, sexism, SF fandom, twitter, wiscon on 2017/04/18 by brainwane. Two different feminists I know recently brought my attention to “On the Design of Women’s Spaces” by Kat Marchán, and I’m grateful to them and to Marchán. The essay provides a useful “hierarchy of exclusivity” that helps all of us think about how our feminist spaces — geeky or otherwise — could make sure that our policies, names, and advertising are not accidentally being exclusive. Recently, while speaking with a group of non-binary folks, a discussion came up about how many of us are uncomfortable in “women’s spaces”. We talked about what these spaces usually intend, how they word things, and how they could align what they want with what they say, in order to get more of us to feel comfortable. Imagine you have a program, and it has a pretty serious issue. It needs some deep architectural changes to fix it, but you can alleviate some of the symptoms by just changing a few lines of code. You don’t yet know the best way to resolve the larger problem, but you need to do something, so you start with a hack. … and we’ve started with that hack, and now it’s one that dozens if not hundreds of online and in-person spaces are replicating. I’m glad for tools and examples that help us get past that first initial hack. We want to be a place where non-binary people and women can make things, learn, and work on projects without fear or intimidation. If this topic interests you, and you’re near Washington, DC, USA, you might also be interested in “Being Nonbinary in Women-in-Tech Spaces: A Panel Discussion”, an event this coming Tuesday the 11th run by Spanning Tree, the DC-area feminist hacker/maker space. And I’d love to see links in the comments to additional essays on this topic. This entry was posted in Uncategorized and tagged gender, gender and sexual minorities, gender binary, genderqueer, hackerspaces, makerspaces, non-binary, safe spaces, women in tech, women in technology on 2016/10/05 by brainwane. 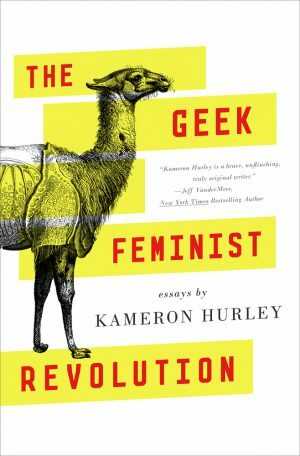 I haven’t been writing very much on Geek Feminism in the last year – most of us haven’t. I’ve also slowed down on posting to my personal blog. And one reason is that when I think about writing anything longer than a couple of paragraphs, anything particularly nuanced, I need to budget the time and energy for pre-editing, to make sure it hits my and our standards for sensitivity, and editing after the fact in case it turns out I got it wrong. You know what I would love? I would love a style guide that helps me write accurately and sensitively when talking about communities and identities, especially when it comes to identities I don’t know through my own personal experience. GLAAD’s reference guide helps with one facet (QUILTBAG people and communities), and there are similar references published by other advocacy organizations, but I’d love a more all-in-one stylebook that covers race, gender, sexuality, religion, and health and well-being, especially in the context of technology. Audrey Eschright and Thursday Bram are crowdfunding to edit The Responsible Communication Style Guide. It’ll be a stylebook for writers and other media creators, covering race, gender, sexuality, religion, and health and well-being, and it’s the first book project by The Recompiler. The Kickstarter deadline is in less than two days. HOWTOs and checklists and playbooks are part of how we make inclusivity more automatic. I’d love to see what The Responsible Communication Style Guide can do to further this trend. So, please join my household in backing this before its deadline, which is this Friday, September 30th at 2:59 AM EDT. (As I write this, they’re 65% of the way to their goal, and need about $7,000 USD more.) I’d love to be able to write faster and with more confidence, and to see what emerges when a whole lot of people with high standards for responsible communication feel the same way. This entry was posted in Uncategorized and tagged diversity, fundraising, media portrayals, writing on 2016/09/28 by brainwane. This entry was posted in Uncategorized and tagged conferences, cons, Events, fun, hacker culture, hacker school, learning, programming, Tech industry on 2016/09/22 by brainwane. Kameron Hurley is the author of the nonfiction collection The Geek Feminist Revolution, which contains the Hugo-Award winning essay “We Have Always Fought.” Her epic fantasy series, the Worldbreaker Saga, is comprised of the novels The Mirror Empire (2014), Empire Ascendant (2015), and The Broken Heavens (April 2017). Her first space opera, The Stars are Legion,will be published from Simon and Schuster’s Saga imprint in January 2017. Additionally, her first series, The God’s War Trilogy, which includes the books God’s War, Infidel, and Rapture, is a science-noir series which earned her the Sydney J. Bounds Award for Best Newcomer and the Kitschy Award for Best Debut Novel. The new book includes several new essays — how did you decide what topics to address in those, and what topics to either skip or address in other venues (such as your blog)? We had a very tight timeline for this collection – it was only about nine months from acceptance to publication, and that was important because we felt this was the right time to launch this collection. Sometimes there is a perfect cultural moment for a particular piece of work, and this was the moment for this book. So I chose essays that I felt would be relevant by the time it came out. Some of those are evergreen essays about feminism and writing and life, and some are framed by pop culture but discuss problems faced by many, such as those harassed by angry exes. It really wasn’t’ a matter of what to keep and what to save, as I needed to write all nine or ten essays in about a month. I believe we sold the collection in May or June and the final manuscript was due in July. It was quite a run to make sure we had a manuscript ready to start the process of copyediting, polishing, and legal review. All that needed to get nailed down very quickly to make time for quality control on the back end. taking out TV ads? Are there simple errors we make a lot, in our social media & other public writing, that you wish we’d cut out? This could be an entire book, or an entire post, at the very least. I often point out that my most successful essay, “We Have Always Fought” about the erasure of women from the history of combat, never mentions words like “patriarchy” or even “feminism.” I opened with a story about…llamas. Once I had you with the llamas, I had you, and I pulled you through the rest and allowed the reader to come to the conclusion at the end instead of pounding them on the head with it. People don’t like to feel lectured. Sometimes we get up on our soapboxes and use our fancy feminist theory words so folks will take us seriously, and what happens instead is that the only people who read those pieces are other people steeped in feminist theory. If you want to reach outside that group of folks, you need to write and speak in an accessible way. I’ve worked hard in my novels to write roaring adventure stories. Folks come for the adventure. It’s only afterwards that they realize that immersing themselves in a really different world with different assumptions made them think about the assumptions of our world. I still get fan mail from people who say that showing the casual sexism experienced by a male character in a world where women were politically and socially powerful made them finally understand casual sexism and how it can grind women down. Alas, we can’t just say, “Constant harassment gets women down!” We have to make men in particular (or women who have not experienced it) feel it, and empathize with it. There is also the matter of the very word “feminist,” which a lot of women stopped using during the 90’s backlash against feminism. Roxane Gay has led the way in rebranding “feminist” and making it a cool word to use again, and that was all in how she positioned it. “Bad Feminist” is a great title in so many ways. Feminism went from “Oh, those ladies are the fun killers” to “Oh, those are the rebellious women, the bad girls, the people we want to aspire to be” which is the best way to energize a movement, especially with young people (certainly the title The Geek Feminist Revolution is meant to inspire similar emotions. Who doesn’t want to be part of a revolution?). One of the biggest roadblocks to the feminist movement in making big changes right now, though, is still intersectionality. The broader feminist movement has a middle-class white feminist problem (still!). We have concentrated a lot on getting powerful white men to support the movement, and I’m seeing a lot of that happening, but where it still falls down is in being more understanding and inclusive of issues facing women who aren’t white, or middle class. I’m also still seeing some backlash against trans women, too, and that’s just awful. We’re all in this together. But we have to move together. I do find that sharing personal narratives and reframing stories in new ways can get people to look at issues differently. I’d like to see us get away from messaging related to, “This woman you’re harassing could be your wife or girlfriend or sister!” and into messaging about how women are people, as the framing of the first instance still implies women are things (the very simple “We are not things” declaration in Mad Max was a rallying cry). Much of the narrative related to women still positions women as Other, and in combating this narrative we have to make sure we aren’t just reinforcing it. As I would tell anyone seeking to change behavior, you can’t just throw out a TV ad and expect it to change the world. You need to focus on your messaging, understand what it is you’re saying, and the best way to communicate it to your target audience. Then you build a campaign around it. Who does that, and who pays for that in an informal movement like feminism, or civil rights, is a tough question, as there will be people inside the movement who despise and disagree with it. That’s as it should be; it’s good to have internal debate. But I suspect this is why we haven’t seen more of it. Movements like Black Lives Matter, We Need Diverse Books, and even Occupy Wall Street, benefit from having many leaders, many points of view, circling around a core set of ideas that many could get behind. I suspect the feminist movement should embrace this model a bit more, as I still see many feminists looking for singular leaders and singular messages, which is impossible to do if we really want to build a more equitable future. If anything, opening up the conversation and inviting more people in will reinvigorate the movement, even more than we’re seeing now. Feminism is simply “Equality.” And though there are many ways to get there – do we become equal by simply having the same set of “rights” as men as set down in the existing broken system, or do we burn down the system? – starting with the core concept of “equality” and working to change the system politically is a good start. If we can’t change it politically, well…. there’s always “burn it all down.” But let’s start the nice way first. I’d like to ask about the effect of your geekiness on your feminism. We’re not just feminists in geek spaces; our geekiness influences our feminism, how we see and conceptualize the world and how we articulate our arguments and what countercultures we build, and I’d love to hear how that’s true for you. I read and write about futures and worlds and people that could be. I recognized early on that if people can’t imagine a thing, it makes it very difficult for them to create that thing. It’s why I work so hard to push the boundaries of what I’m doing in my own geeky fiction, and seek out geeky work that challenges me, too. I present worlds in ways that we haven’t seen before, or certainly ones we haven’t seen as normalized before. So many stories get presented as alien – you get this with The Left Hand of Darkness, where we the reader are given an outsider’s view of a society that still leaves us feeling it’s alien because the protagonist comes from a two-gender, patriarchal society. One of the amazing things that happened to me in writing my Worldbreaker Saga was that it started to normalize new ways of looking at gender, not just for readers, but for me. I had characters who switched pronouns throughout their lives, and had polyamorous relationships, and a consent-based culture, and normalizing that in my own mind made all those things normal in real life for me, too. It’s much easier to ask someone which pronoun they prefer, and I no longer make an assumption that folks who have girlfriends don’t have husbands, or multiple boyfriends and vice versa. I was able to normalize in my mind the actual world as it is now instead of the one we see on TV. I saw human beings and their behavior as much more fluid and less static. I certainly hope the process of reading my books helps the readers the way it did me. Feminist science fiction writer Joanna Russ once said that she wrote science fiction because it let her imagine how things could be really different, and that’s true for me too. I need to believe there is another world, a better world, or even just a different world. It’s a lie that human beings have always paired up into heterosexual couples, or women have always had less political power, or men have always sexually assaulted people. There were and are different ways to be, different social mores that govern what types of behavior are OK, different laws. If I can see it on the page, and imagine it, then I know it’s possible to create it. This entry was posted in Uncategorized on 2016/06/06 by brainwane. This entry was posted in Uncategorized and tagged computing, consent, economics, fundraising, Linkspam, saying no on 2016/03/22 by spam-spam.